HONOLULU - Hurricane Lane drenched Hawaii Thursday ahead of its arrival in the island state, prompting U.S. President Donald Trump to declare a state of emergency as landslides and flash flooding left roads blocked. The National Weather Service said Lane — located about 200 miles (320 kilometers) south of Hawaii — remained a powerful hurricane, packing winds in excess of 130 miles per hour (210 kph), although it was downgraded to Category 3 midafternoon local time. “Someone once told me it wasn’t raining when Noah built the Ark,” American Red Cross vice president Brad Kieserman told a news conference in Washington. 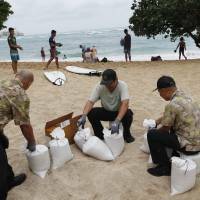 “Last couple of days it’s been like this — it’s been busy,” said Chris, an employee at a gas station in Haleiwa, on the north shore of Oahu island — the location of the capital Honolulu. Surfers were observed taking advantage of the calm before the storm to get out on their boards one last time Wednesday before the ocean got too violent. United Airlines announced it had canceled all Friday flights to and from Kahului International Airport on Maui, the second-largest island. 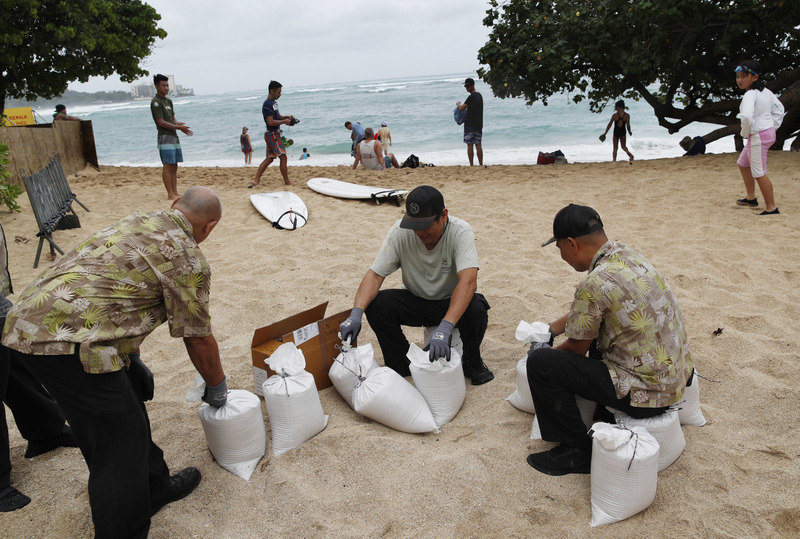 The U.S. Coast Guard said 57,000 U.S. military personnel already stationed in Hawaii stood ready to launch search and rescue missions, and provide logistics and medical support. “Hurricane Lane is not a well-behaved hurricane,” Governor David Ige said in a statement as he declared a state of emergency Tuesday on Big Island. “I’ve not seen such dramatic changes in the forecast track as I’ve seen with this storm. Hurricane-related deaths in Puerto Rico have been estimated at as many as 4,600 people, largely because prolonged and widespread power outages and washed out roads prevented access to health care, according to U.S. researchers.